I really enjoyed it. It features the classic horror line up... college kids, off to West Virginia to go camping in hillbilly territory, to have a good time. Oddly, two guys (Tucker and Dale... who are hillbillies) have bought a cabin in the woods as a holiday home, and are also travelling up to the forest to relax. Unfortunately, there is miscommunication when one of the college girls falls off a rock in to a pond, and Tucker and Dale rescue her; but the college kids believe them to be kidnapping their friend. What ensues is a comedy of errors where both parties believe the other to be stalking, threatening and killing the other. I really enjoyed this. It was in the same vein as Sean of the Dead and Hot Fuzz, although it is a Canadian/American film. It made fun of the horror genre without being as blasé as the Scary Movie franchise - and not so obscure that you don't really get it. It was nice to watch something from the other perspective... instead of crazy hillbillies hunting college kids, it was pretty much the other way round. 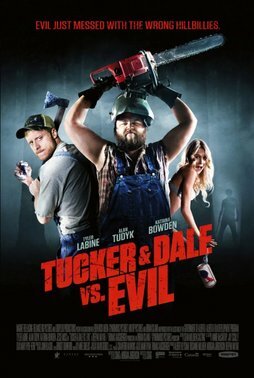 According to Tucker and Dale, the college kids just surrounded their cabin and started killing themselves (it is very funny!). The great thing is, is that the film has also tried to inject a mystery in the plot that Dale (the not so smart one) unravels with the college girl he was thought to have kidnapped. I believe we see crazy hillbillies in Wrong Turn, CSI and even in Criminal Minds. It seems to be a recurring theme that pops up in American films and so seems to be a part of the public consciousness. The film won four awards in a variety of categories. It stars the pirate guy from Dodgeball... if you remember him at all? He was also in Knocked Up - he was the boss I think! Anywho, I recommend this film for those getting together with their friends. For those who believe that hillbillies are just plain misunderstood, and of course for those who like to see college kids die in horrific ways. It's all very awesome. The trailer is below - enjoy!